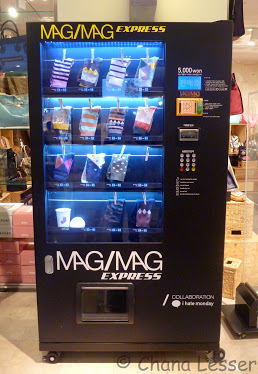 I’ve seen a lot of interesting vending machines in Korea offering things like books and printing cartridges. In the US I once saw one selling the acne clearing system Proactive and then there are the ubiquitous vending machines in airports around the world selling anything from headphones to Rosetta Stone. But I’ve never see one selling socks,yes socks! Why you say? I say why not? You never know when you’re gonna need some socks!